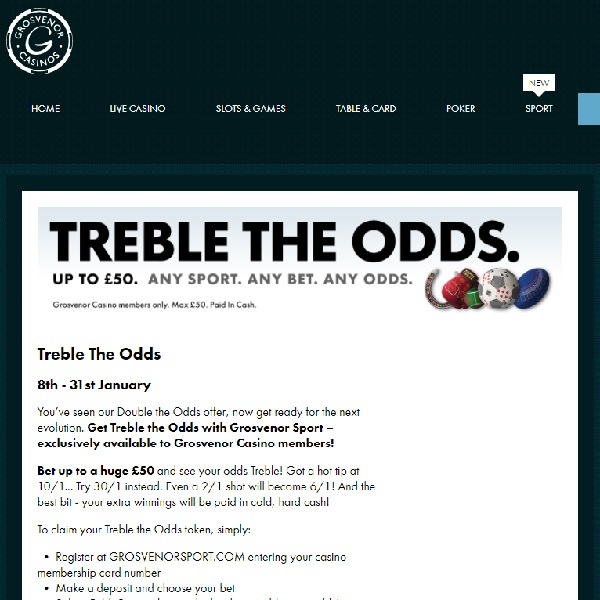 If you enjoy online casino play and also like to bet on sports then you will love Grosvenor Casino’s Treble the Odds promotion. From now until the end of the month they will treble the odds on your sports bets and you can bet up to £50. This means that if the original odds were 10/1 you will get 30/1. Even short odds, such as 1/3, are trebled to increase your potential winnings. To take advantage of this offer simply head over to Grosvenor Sport and register with your casino membership card number. Make a deposit, choose your bet, and on the bet slip select ‘Odds Boost’ token to treble the odds. This is a great way to massively increase your returns but the offer is only available until the middle of next week so make sure that you don’t miss the chance!